The company is relatively small but the explosion in revenue last quarter is appealing. And based on the space, it immediately becomes a candidate for a takeover. As a recipe for a blowout initial public offering, a storage firm with a dash of social media looks tough to beat. That's the buzz around Fusion-io, set to go public next week. Fusion-io's specialty is selling NAND flash memory to enterprises. An alternative to traditional hard drives, NAND is popular because it uses less power and retrieves data faster. Fusion-io is bringing NAND's benefits to data centers, where storage can be a bottleneck. Traditionally, servers process data requests from users, and call up data stored in a hard drive nearby. Fusion-io speeds the process by putting data on NAND flash inside the server itself, where it's easier to retrieve. Gartner estimates the market was about $1 billion in 2010 and will expand an average of 40% a year through 2015. The technology is particularly appealing for the likes of Facebook and Apple, which need to deliver data quickly to users. 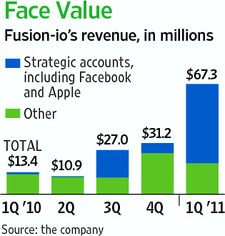 The two accounted for 52% and 20% of Fusion-io revenue, respectively, in the first quarter. Fusion-io says in a Securities and Exchange Commission filing that sales to Facebook will decline significantly this quarter, even as it seeks a $1.4 billion IPO valuation. Fusion-io is burning cash and had just $16 million in the bank as of March, so the $160 million it hopes to raise is much needed to finance growth. Another problem, Fusion-io faces a flood of new competitors, says Gartner analyst Joe Unsworth, though it has a head start and will package high-margin software with its hardware. Like 3Par and Isilon Systems before it, Fusion-io also looks like a juicy storage takeover target. Fusion-io has raised more than $110 million in venture capital, and it counts Apple Inc. co-founder Steve Wozniak among its top executives. Sales in the first quarter surged fivefold to $67.3 million, from $13.4 million a year earlier, according to the filing. Assuming the same revenue over the next three quarters and a $1.17 billion valuation, Fusion-io will be valued at 4.35 times sales. Fusion-io turned profitable in the first quarter, reporting net income of $7.04 million, compared with a $6.71 million loss a year earlier. The company’s biggest shareholder is venture firm New Enterprise Associates, which owns 39 percent of the company. Lightspeed Venture Partners holds 13 percent, and Chief Executive Officer David Flynn controls 10 percent.